I had a craving on the way home from school for Shrimp Creole. I had recently come into 10lbs of fresh caught GA shrimp so I knew the shrimp would be awesome. I started the sauce with 1 can of chopped tomatoes and 1 jar of marinara sauce – you could make this from scratch if you had the time, but I didn’t and besides, I am way too lazy. I did, however, doctor the sauce. I added quite a bit of red pepper (you can do this to taste) and about a tablespoon of old bay seasoning. I also added a healthy glug of red wine and a bit of salt. (If I had had an onion on hand, I would have also added some chopped onion to the sauce, but it was fine without it). 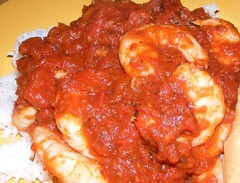 As the sauce was simmering away I steamed a cup of rice and peeled about a pound of shrimp. About 5 minutes before you are ready to eat, turn the sauce up to a boil and add the shrimp – when they are no longer translucent cut the heat to the sauce and serve immediately over rice. There was just enough heat from the red pepper to make the sinuses tingle, but not so much that you couldn’t taste the beautiful shrimp.